The Turkish-Armenian war of September-December/1920, and the fall of the First Republic resulted in the treaty of Alexandropol signed by the representatives of Armenia and Turkey on December 2 1920, in accordance with which Armenia was to give up all the territories granted to her by the treaty of Sevres and to cede to Turkey about 60 per cent of her prewar territory. However, as a result of the Soviet conquest, Armenia became a Moscow-controlled puppet “Soviet Republic“ on the same day of December 1920, when the treaty pf Alexandropol was signed by the representatives of he fallen government thus putting the legitimacy of that treaty in question. Further political and military development in the South Caucasus resulted in the fall of Georgia, the last pro-western country in the area and the conquest of her territory by the Soviets and the Turks (19.03.1921). The communist decision-making centre in Moscow was planning to unite all the Soviet republics into a new quasi-state that would include Armenia, Azerbaijan and Georgia but before that the territorial disputes were supposed to be resolved. The Soviet-Turkish borders established as a result of the wars of Sept./1920 – March/1921 were adjusted and confirmed by the treaty of Kars signed by the representatives of Turkey and the four Soviet republics of Russian federation, Armenia, Georgia and Azerbaijan on October 13, 1921. According to the provisions of the treaty of Kars, the treaties of Sevres and Alexandropol were denounced and both the Turkish and Armenian sides agreed to forgive each other all the “military crimes and mistakes” committed by their representatives during all the wars, conflicts and ethnic cleansings of 1915-1920. 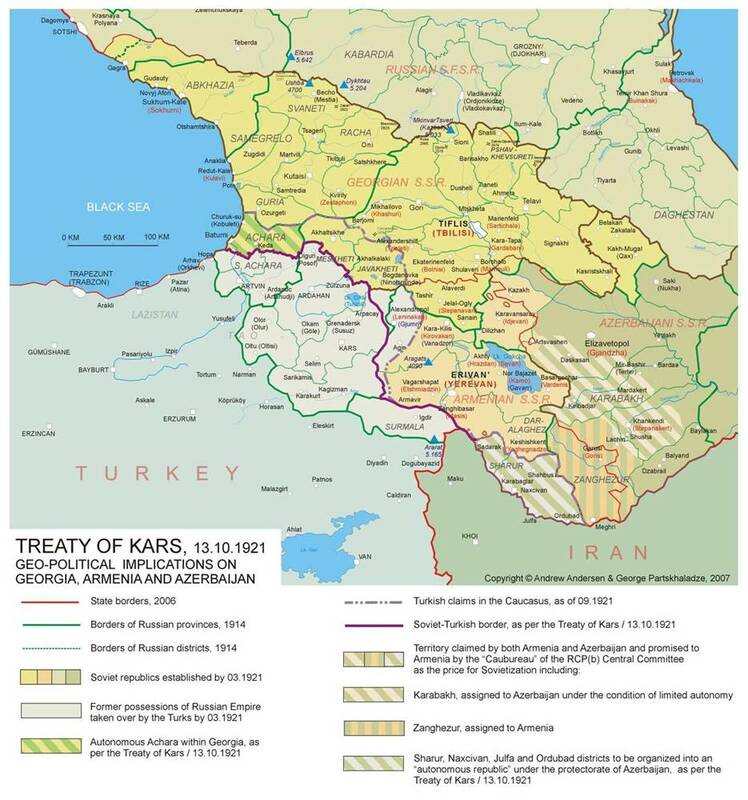 The treaty of Kars left Turkey with most of the territories conquered during the Turkish-Armenian war and the Soviet-Turkish war against Georgia. Turkey re-gained almost all the territories lost to the Russian Empire during Russo-Turkish war of 1978, except northern half of Achara, with the towns of Artvin, Ardahan, Olty, Sarykamysh, Kaghyznman and Kars. Turkey was also granted the large part of the former Yerevan province to the south of Araxi river with the town of Ighdyr and the mountain of Ararat (the national symbol of Armenia). The latter territory had never been a part of Turkey, except a short period between 1724 and 1735. In turn, Turkey returned the area of Alexandropol to Soviet Armenia and dropped all the claims to Sharur-Naxcivan-Ordubad area under the condition that the area is not to be incorporated into Armenia but becomes a Muslim-dominated autonomy within Azerbaijani SSR. The above territorial losses were and still are regarded by many Armenians as a national catastrophe, and the borders as defined by the treaty of Kars, are far from been fair from the point of view of Armenian nationalists many of whom still consider the treaty of Sevres as the basis for the resolution of Turkish-Armenian conflict. The territorial dispute between Armenia and Azerbaijan was also supposed to be resolved in order to keep both Soviet puppet-states under Moscow umbrella. Basing on the promises of Soviet emissaries at the brink of sovietization, as well as on several decrees issued by the Caucasian Bureau of the Communist Party (trans-national organ created by Moscow to solve basic regional problems), the communist leadership of Armenian SSR expected to be granted most of the disputed areas, including Karabakh, Zanghezur and Sharur. 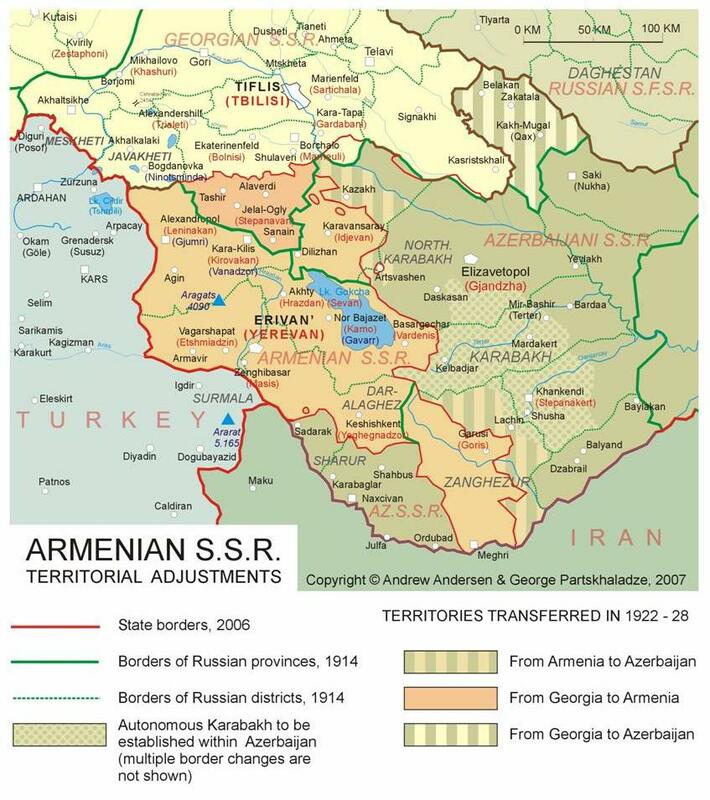 However by the fall of 1921 following the orders received from Moscow, the Caucasian Bureau finally granted to Azerbaijan both Karabakh and Naxcivan while Armenia received Zanghezur separating Naxcivan from the rest of Azerbaijan and providing Armenian SSR with an access to Iranian border. In summer 1923, Karabakh was granted some limited territorial autonomy its historical territory being reduced to 6 districts out of 10 and its borders redrawn a number of times.